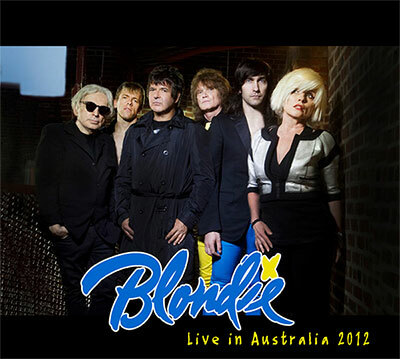 McManus Entertainment is thrilled to announce the return to Australia of one of musics most acclaimed bands, Blondie, and DiscLive Network will be there to capture just TWO spectacular shows - at the Sidney Myer Music Bowl, on Dec 3, 2012, and the Enmore in Sydney on Dec 6, 2012! We will be offering limited edition, NUMBERED live collectibe two-CD sets of the performance to fans who attend the shows, and those round the world, while supplies last. Blondie emerged from New York in the late 70s and quickly became music, style and pop culture icons selling over 40 million albums globally throughout their 37-year career. Scoring hits with reggae, rock/disco, hip-hop and pop songs alike, Blondie pioneered the early American new wave and punk scenes of the 70s. The disco-infused track Heart of Glass was Blondies first US number one single which became a worldwide hit selling more than a million copies. Blondie repeatedly reached the top of the charts over the course of four decades with hits such as One Way Or Another, Rapture, The Tide Is High, Call Me, Picture This, Rip Her To Shreds, Hanging On The Telephone and Maria. The band landed a phenomenal five US and five UK number one singles cementing them as music royalty. Deborah Harry is unquestionably one of the most important and influential women to have graced the stage and a living punk icon. Blondie has continued to be a powerhouse live act, attracting audiences around the world. 2006 saw Blondie inducted into the Rock and Roll Hall of Fame with the bands plaque situated right below The Beatles. This is the first time Blondie has EVER done an "instant" collectible product ANYWHERE - so make sure and reserve your copy TODAY!